Because learning begins the moment a puppy is born! Welcome to Puppy Prodigies Neo-natal & Early Learning Program! If you are looking for info on Surf Dog Ricochet, Aqua Dog Cori, Waves of Empowerment, or our canine-assisted surfing, swimming and playing programs please visit Surf Dog Ricochet's website and Facebook page where our adult dog programs are outlined in detail. 1. Exceptionally talented: one who possesses extraordinary abilities or talents developed at an exceptionally early age. 2. Something marvelous: something very impressive or amazing. 3. An act or event so extraordinary or rare as to inspire wonder. ​But, most of us would agree that it is difficult to predict the adult personality of a puppy. Since that's not possible, we focus on the puppy's early weeks which are crucial to their later success in training, and in life. ​We specialize in early learning and development from birth to 7-12 weeks of age. This gets the puppy ready for the next phase of their training by “learning to learn”. ​Our program covers whelping, imprinting, stimulation, habituation, conditioning, enrichment, socialization, training, and screening for future roles/homes. 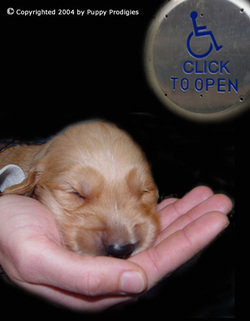 We also incorporate intermediate and advanced service dog training into our initiatives. It's our mission—and our great privilege—to provide this program model to assistance dog organizations, rescues, shelters and others who could benefit. Our program is very labor intensive, and unless you are willing to dedicate 2 months of your time, 24/7 to the puppies, we don't believe you should be breeding. For the rescues and shelters that want to incorporate this program, but don't have the resources, any of our methods, exercises and activities you are able to do will still benefit the puppies. Doing something... is better than doing nothing. ​We have taken a detour from our Neo-natal & Early Learning focus to incorporate the work of an incredible pup that was part of our neo-natal program. Ricochet was slated to be a service dog for a person with a disability. But, at about 9 months of age, she started showing interest in chasing critters. We worked with her for months, and she was very good a controlling her impulses. But, we knew we couldn't place a dog with a person with a physical disability that had a chase instinct such as hers. Because she had such good balance, and coordination she also learned to surf. Her role went from service dog to SURFice dog the day she jumped on a surfboard with a 14 year old boy named Patrick who is quadriplegic. As the years passed since her birth, she started working with military with PTSD. Because this isn't a physical disability, service members and veterans sometimes utilize Ricochet's service dog training as they handle her. We started a PTSD Battle Buddy Initiative for her and "her soldier", Randy Dexter. So now she is a therapy dog, service dog when handled by military with PTSD and SURFice dog. She's also raised almost a half million dollars for human/animal causes. As such, Puppy Prodigies has become more than our neo-natal work. We also raise awareness for various causes, fundraise for humans/animals in need, provide Ricochet's paws-on healing and create programs for community outreach. Our website is still used as a resource to those interested in learning more about puppy development and training. We'd like to extend a warm welcome and invite you to "surf" our site to learn more about our protocols and please visit Surf Dog Ricochet's website and Facebook page where most of our canine-assisted programs are. went viral on YouTube & has over 6 million views! our puppies teach us what life is all about"